A couple of years back, a college friend invited me to dinner at the newly opened Rockville Town Center in Maryland at a new Thai restaurant (read blog). On my way out, we stumbled across another new establishment serving Peruvian cuisine that peaked my curiosity since I knew of only one locale serving such fare located in DC which has been a regular haunt of mine and my dinner group (read blog). After perusing its menu displayed by its door, I have been meaning to stop by to try out its appealing menu. Well, more than two years has passed by and last Sunday was the opportunity for me to stop by with an online coupon in hand. 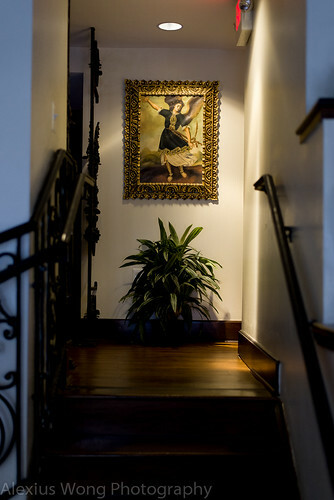 Entering the doors of La Canela, you are enveloped by a space that exudes an ambience of Spanish Colonial with wrought iron in its windows and banisters, further weighted down by heavy and chunky wood furniture. I chose a table by the window in order to get some good light for the food photos. Perusing the menu, a half-portion of Fish Ceviche stood out due to the smaller plate size and its must-order aura due to its reputation within this South American cuisine. The bowl arrived neatly dressed with the various elements showing a rather careful hand putting the dish together. One bite into the dish spoke its language: the star ingredient here was the pieces of mild-tasting and very fresh mahi-mahi that was slightly milky from being “cooked” from the tart lemon juice while still retaining the slightly raw sashimi-like texture and flavor, as if it were a form of Peruvian Sushi. The other notes in the sea-sweet fish pieces were some slight heat from fresh red aji (chilies) and fragrance from cilantro. To balance out the acid, a piece of boiled sweet potato and some imported Peruvian corn kernels (choclo) provided the necessary sweet relief. But I was blown away by the super-size of the corn and its thick skin that reminded me of hominy, which immediately whisked me away to the Motherland of corn in the Andes. The pickled red onions added a note of more acid and some pungency that dressed these mild flavors. This was an excellent rendition and great-tasting Ceviche, making it the perfect opener from this cuisine. With lots of value on the deal, I decided to try another appetizer that caught my attention due to its unique description – Yuquitas de Cangrejo. Two plump croquettes arrived with a bowl of pinkish side sauce. Breaking into them, the stuffing of crab meat in a reddish sauce revealed itself. One bite into it, I was perplexed by the flavors and textures. 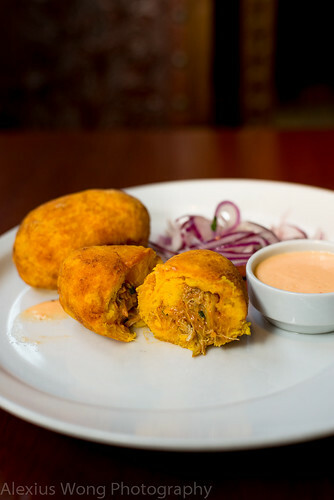 The outer casing was soft and quite sweet, reminding me of sweet potato rather than the more mealy and bland Yuca root listed in the menu – my waiter confirmed that the later was the tuber used, which I beg to differ. The stuffing was quite generous with the crab meat, listed as “jumbo lump” on the menu, mixed with a “Sarza Criolla” sauce that tasted a bit spicy and tomato-based. However, due to the sweetness of the “yuca” and the slightly sweet and spicy stuffing sauce, the mild seafood was nearly lost in the whole mix, and pretty much did not stand a chance with the other flavors, this being a common flaw found in many restaurants dealing with this delicate ingredient. The side spicy mayo-based sauce, “Recoto Emulsion”, was tasty but yet another foe to the poor pieces of crab. 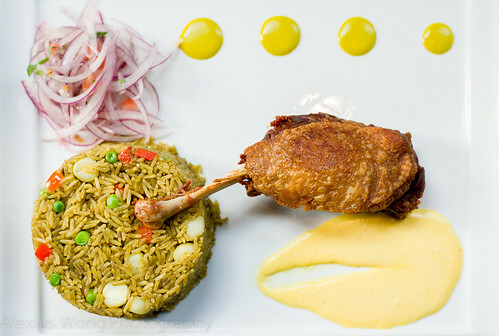 Arroz con Pato was the first dish listed in the Entree section, which sounded very appealing to me. The impeccably dressed plate arrived with the different elements carefully arranged – photos never lie. But the proof is in the pudding, or in the tasting. The main star, listed as Mallard duck on the menu, had its skin cooked crispy but the fat underneath was not completely rendered as I would have liked it, but that was easily solved with some gentle scraping to salvage the luscious crackling. The meat underneath was rich, well-seasoned, still quite moist, and falling off the bone, a la confit, which I was enjoying every morsel despite being a bit greasy. The side of rice was interesting and quite tasty, listed as cooked with green aji, cilantro and dark beer, which lent some fragrant vegetal, a mild chili bite, and slightly bitter hop flavors to each grain, studded with sweet red peppers, green peas, and that-so-intriguing Andean corn – my only quibble was that the rice could have been cooked with a bit more moisture. The side sauces were intriguing and matched formidably with the strong dark meat: the yellow one was made with mustard, cream and parmigiano; the green was a combination of mustard, green aji, and olive oil that exuded some of its fruity notes. The side “salad” of pickled onions and tomato bits seems de rigeur with each dish served here, providing some acidic pungency to clear the palate from the rich duck flavor. Despite some minor flaws, this is a very tasty duck dish and it was worth ordering. 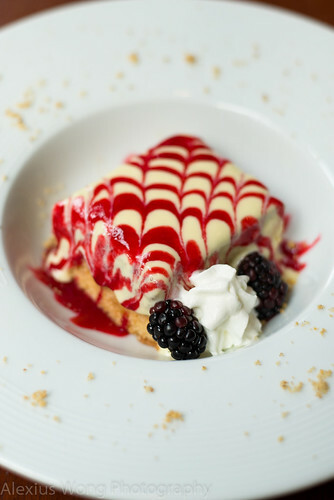 With a bit of value left on the online deal, I decided to order some dessert, and I chose a Latin American favorite – Torta Tres Leches, since the Pastry Chef was on vacation and my initial choice, Chirimoya Panna Cotta, was not available. The cake arrived looking pretty with a Creme Anglaise and Raspberry Coulis pattern sitting on top, accompanied by some fresh blackberries and some whipped cream. One bite into it revealed a rich light cake made moist by a soaking of the “three milks”, a mixture of regular, condensed, and evaporated milk. It was a relief that this dessert was not too sweet, but the cake was a bit too rich for me, since the raspberry coulis was not fruity enough to maintain my interest, and the lack of some vanilla notes in the cake mix was no help either. This dessert was not bad (I’ve had better) but I think that Panna Cotta amiss from the days’ offering would have been the ideal finale. The Peruvian Doughnuts sounded very appealing with its unique description, but alas, I’m on a diet, supposedly. 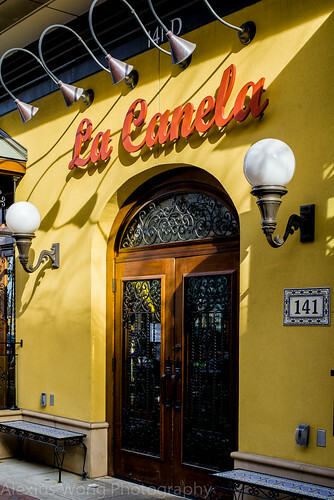 La Canela takes Peruvian cuisine to a higher refined level judging by the well-prepared and beautifully presented dishes. 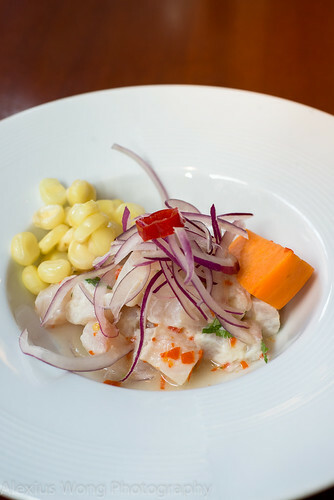 The opening half-portion Ceviche was the perfect appetizer with the so-fresh fish barely cooked by the acidic lemon juice, and matched by the intriguing Andean super-corn and sweet potato. The Crab Croquette was a mismatch of ingredients in my mind, but the cooking was nearly flawless. The Duck with Rice dish was quite a masterpiece with the piece of leg and the interesting rice cooked to near perfection; fortunately their minor flaws were compensated by their satisfying flavors. Although the Tres Leches cake was not bad and didn’t keep my interest for long, I sense that the other desserts listed would have gone well with me if only they were available if the Dessert Chef were not playing hooky. Yes, waiting two years was a bit too long to come back to pay this restaurant my first visit, but better late than never.